It was a warm winter day. Snow was falling and my 8-year old was ready to ride the youth snowmobile. I was determined that he was going to learn to do this. While Chase loves to “drive,” he is more concerned with everything around him than the road right in front of him. He watched his older brother jump on and thought that he should be able to ride as fast as he does. It became clear very quickly that jumping on with loose supervision was not going to be enough. After running into the car, running over the landscape (although covered in snow), it took two of us to form a barricade, wave our hands, and teach him to slowly press the gas. With multiple attempts, he got it. However, it was not without a major re-assessment of strategy (and a few minor dents in a car and some trampled plants). Accuracy: Write learning goals and progressions to help students see the pathway to learning. Show examples of what it looks like. There are different components that lead to achievement. Determine what students need to know and be able to do to achieve and what it looks like when they have. Most likely students will need practice in one or more of those components to fully achieve mastery. For Chase, it was learning to slowly press the gas. Just telling him to drive the snowmobile did not work. With too many directions, Chase would get overwhelmed and frustrated, and quit. 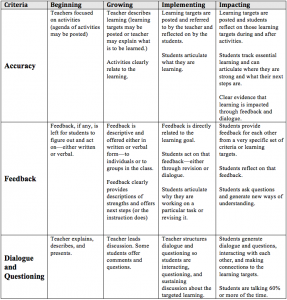 Feedback: Give targeted feedback to help learners move along the progression. Ask them questions so they can recognize where they are on that continuum and what they need to do to improve. We watched Chase and quickly assessed that he needed help with the how and when to press the gas. He also needed a model of what it meant to “slowly” press the gas. Assessment in action is some of the most powerful information for helping students achieve. That targeted feedback provided information to Chase that gave him confidence and hope. But it also gave us a lead on what practice would make him successful. Dialogue: Use different structures to generate conversation. Directly teach students how to discuss and how to craft questions, and then do lots of it. This type of dialogue helps learners solidify their understanding and gives the teacher incredible insight into their level of understanding. Just by listening to the conversation, teachers can see how students perceived the instruction and make adjustments or maneuvers to guide learning. Dialogue comes naturally to Chase, so he was happy to share what made the biggest difference in driving the snowmobile when asked. He was happy to describe the process and how he learned to ride successfully. Assessment in action leads teachers to see when students are learning and be agile enough to make decisions about how to facilitate more of that learning. At its best, the feedback and dialogue lead students to see their own learning and make decisions about how to move their learning to the next level. 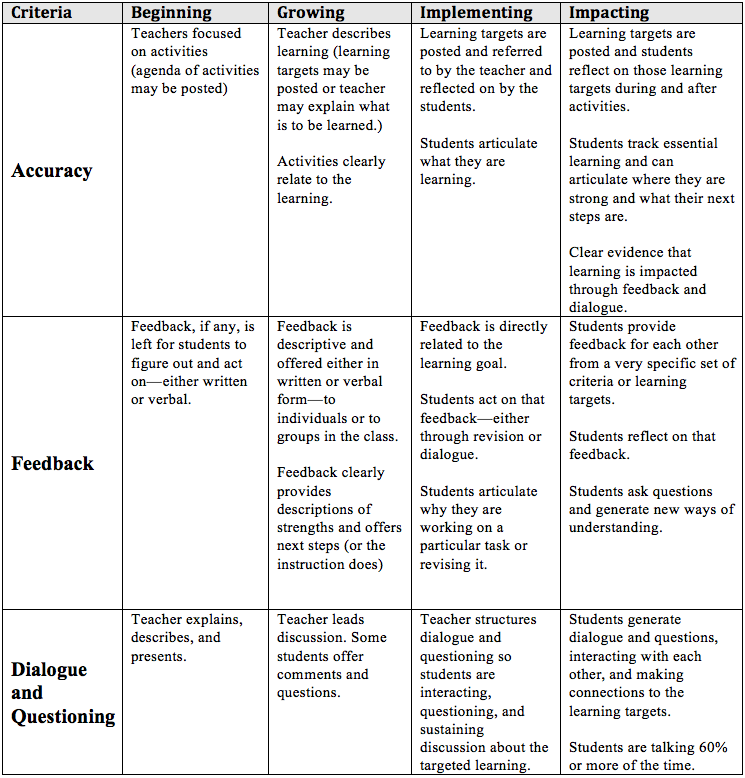 The Assessment in Action rubric generates focused feedback and reflection opportunities as teachers work together to help impact student learning and confidence.